Looking to snap up a few domains for your portfolio while you're on the go? If so, you're in luck; domain name auction marketplace Snapnames has released a new Android app for that exact purpose. 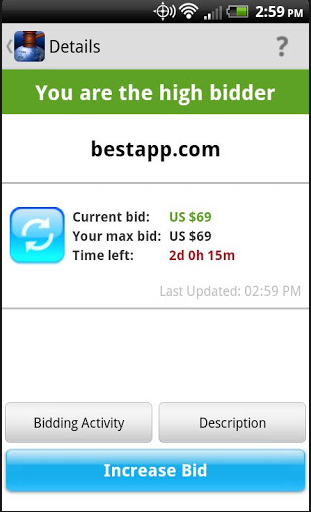 The app enables users to bid on domain names, view auction activity (bidding activity, number of bidders, time remaining, high bidder status) and recent auction activity (history). The app unfortunately does not allow users to add new domains to an account, only bid on domains that were currently added through the SnapNames mobile site. Snapnames released an app for iOS last month.